When I was about 8, I think, we drove on our first family vacation out west. I remember the Corn Palace. 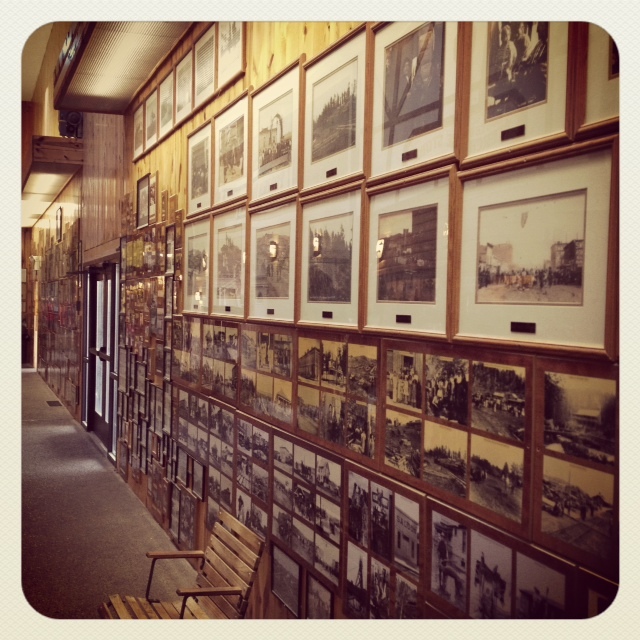 Wall Drug. Deadwood. Mount Rushmore. 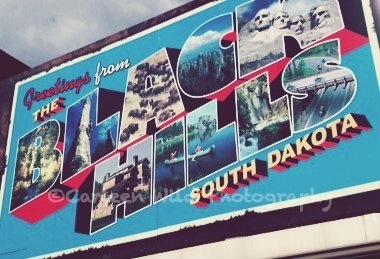 Black Hills.. the trip went on. I didn’t like it at the time. I didn’t like the wide open spaces. I thought it was hokey we stopped in a town just because they were advertising ‘Free Ice Water’. Why would someone do that, I thought. Everyone serves free ice water. I had no intention on ever coming back. To Wall Drug. Or “out west”. Not on purpose anyway. Looking as far as the eye could see on much of that trip with no one in sight, meant to me, we would most likely get a flat tire somewhere or attacked by prairie dogs. Cell phones didn’t exist. We’d shrivel up and die and no one would ever find us. I wanted to get back home to Wisconsin. Where there were people around. People that would see if anything were ever to happen to us. And they would be there to help. We were in Wall again last weekend. Chances are, you probably don’t even know the town is called Wall. Not Wall Drug. Because the town’s done such a great job marketing itself and the free ice water. Anyway, I had a minor freak out moment the first night we got there, to myself, as I soaked up the scene around me. Sitting that night on the back patio of what is now a family member’s home just a block away from the Drug Store, I remembered the scene described above and thought to myself, am I really here? Living like a local? WTH? How did this happen? I could hear and see people talking and laughing and having a beer around me but everything was muffled and distant. My mind started racing through major life events between my childhood and now. I snapped quickly back into how awesome this new reality is. While we live in eastern South Dakota, a big part of the Cowboy’s family is from the Wall area. 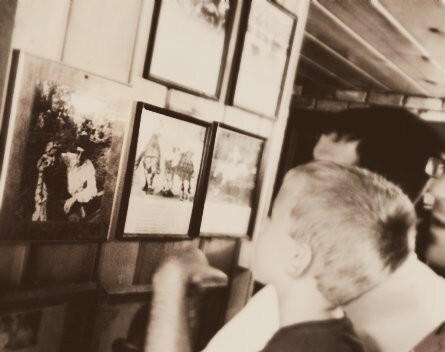 The Cowboy and one of his brothers showing kids a family photo in one of Wall Drug Store’s back hallways.. There is incredible history to both his family here and to the area that I feel people miss, unfortunately due to all the trinket shops that line the main street through town. Wall wouldn’t be what it is without this couple block stretch so don’t get me wrong. It’s a ton of fun, tourists coming through each year sustain this little community of incredible, hard-working people and we’ve enjoyed all Wall has to offer each time we’ve gone now to visit. But here’s the deal: I walked over early last Friday to the Drug Store. I wanted a cup of coffee and a quiet spot to get some work done. I ended up ‘out back’, where I was told I could find both. Despite how many times I’ve been back to Wall as an adult, as a single mom bringing her daughter back for the same childhood experience I had myself and in the times I’ve been here with the Cowboy, I’ve never seen what I did that morning. All was quiet. The walls weren’t yet masked with throngs of families working their way through the buildings. And it was there, for the first time, I sincerely saw it. History. So much history of that area. Photos of families. Of pioneers. Of ranchers. Of the Native American culture that is still so very genuinely present. A culture there people are proud of. That often gets lost, understandably, in all the shopping, stretching of legs on perhaps an otherwise long road trip, of needing to feed the kids that are screaming and not feeling up for a history lesson. But what a part of Wall you are missing .. Speaking of something else you may be missing on a rushed trip through the area, the locals. Met two this past weekend, writing about tomorrow. So much for getting a whole lot of work done that morning. This entry was posted in Cowboy, Lifestyle, South Dakota, Tourist, Uncategorized, Wall Drug, Wisconsin and tagged Free Ice Water, History, Out West, South Dakota, Tourist, Wall, Wall Drug by Carleen Wild. Bookmark the permalink.